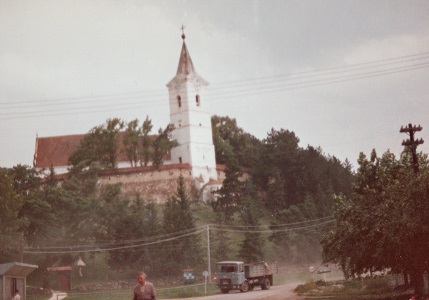 In my parent’s photo from 1983 a soviet style flat-bed truck raises dust clouds as it rumbles through town. Now the roads are paved. My cousin told me about a local politician who was able to direct infrastructure improvement funds to the village for that purpose. Woodcarving is still an honored craft in the area. 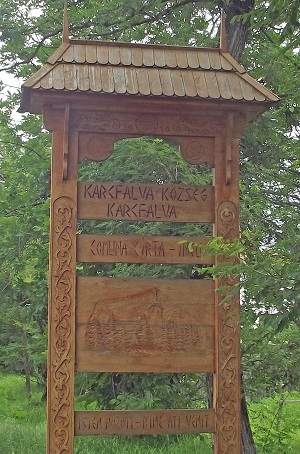 The welcome sign, with a raised relief of the church is carved in the style of the Székely gates (kapu) of the region. A Székely kapu arches over the path up to the church. 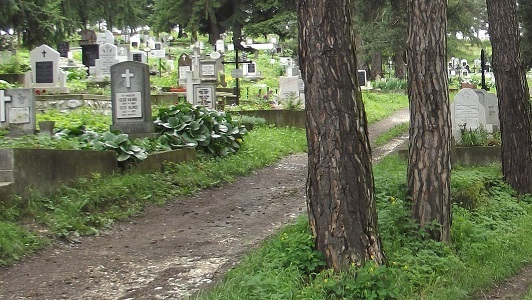 Another cousin came to meet us in the church yard to point out the grave of Borbála’s younger brother Ferenc. When Ferenc’s wife died, his youngest daughter was just a teenager. 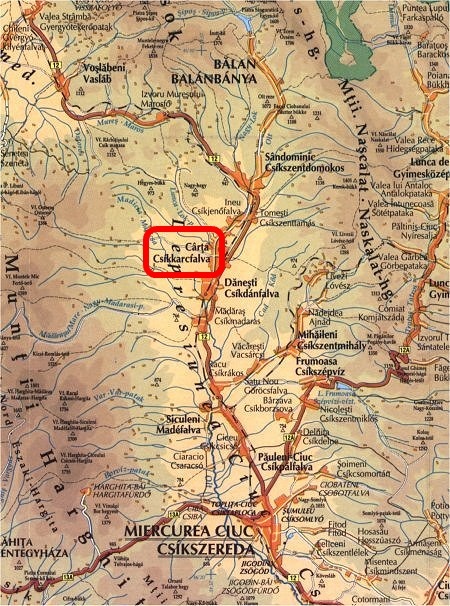 He sent her to Székelykerestúr to live with Borbála. A friend gave the teenager this watercolor of the church as memento of her hometown. She’s a great-grandmother now and still treasures the picture. We went back to the house to meet the cousin’s mother, a sweet little lady chattering at us in Hungarian. 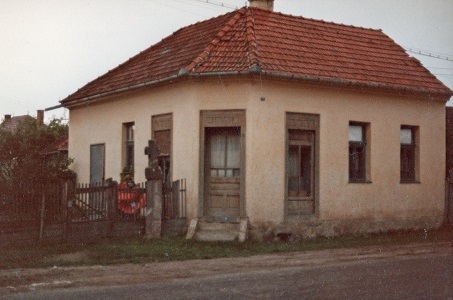 The tidy little home, typical of the area, looked much like the house where Borbála grew up. There was a day bed in the kitchen across from the wood stove, a cozy place for a nap during the cold mountain winters. Over coffee, the little lady exclaimed that she never expected to have Americans in her kitchen. It was a pleasant surprise for us too. I guess my mother didn’t know her, but I’m sure she would have enjoyed meeting her as well. 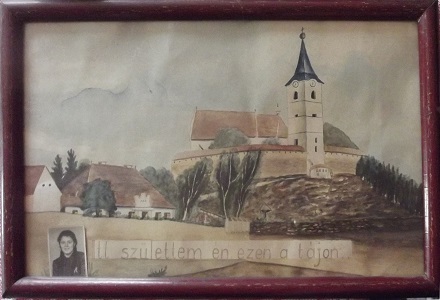 This entry was posted in Csíkkarcfalva, Erdély/Székelyfőld, Orbán and tagged Borbála Both, Hungarian Genealogy, Székely by edesorban. Bookmark the permalink. We visited a number of ancestor hometowns. Didn’t spend a lot of time but it was illuminating to see how different the places were than places I have lived in North America. I really enjoyed meeting the coffee lady.